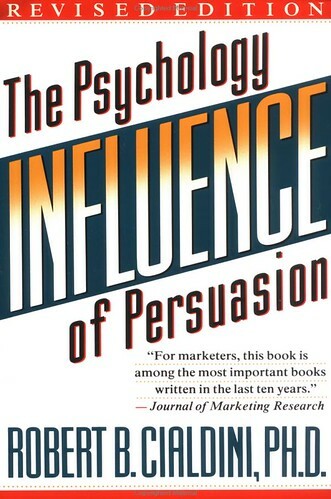 When looking to understand user psychology in order to design better product experiences, Robert Cialdini's seminal work, Influence: The Psychology of Persuasion, is a classic read. Robert Cialdini brings to bear his years of research on influence to detail the 6 weapons of influence leveraged by compliance practitioners (salesmen, car dealers, fund raisers) to get you to say yes to whatever they are selling. These same tactics can be leveraged in designing product experiences to help delight users as well as drive them to our desired product behaviors. The reason the tactics are so effective is due to fixed action patterns, which are automatic responses in humans to certain behavior. These fixed action patterns exist because they are a very efficient form of behavior that allow us to act without thinking, thus minimizing brain strain. Many simple examples of this exist. For example, a mailed out coupon that provided no saving (due to a printing error) produced just as many customer responses as the one that actually provided the discount. Let's walk through each of the 6 weapons of influence and how they can be leveraged in digital product design. Reciprocation recognizes that people feel indebted to those who do something for them or give them a gift. There is generally a distaste for those who make no effort to reciprocate and thus we will often reciprocate simply to avoid being seen as one of them. You'll often see Hare Krishna society members give a free gift of a flower before asking for a donation, which helped them to effectively raise far more than other groups due to this principle of reciprocation. Social apps regularly leverage this principle, encouraging you to like, favorite, or recommend the content of another user, which often elicits a subsequent reciprical response from the recipient to return the favor. This not only makes both users feel good, but drives further app engagement from both actors. After making a choice or stating a commitment, either orally or in writing, both personal and interpersonal pressures drive us to behave consistently with it even after the initial motivation is no longer there. This is both due to our culture highly valuing personal consistency as well enabling us to avoid having to think after we've made a choice. For example, a group of folks were asked to wear a cancer awareness button for a week. Most thought it was a harmless request and complied. Some time later these same people were asked to donate to help fight cancer. And this group donated much more than the control group since it had become a small piece of their identity. Habit building apps often drive you to share your goals with your friends, family, or co-workers to drive behavior through this exact principle of public commitment and consistency. When someone is uncertain about a course of action, they tend to look at those around them to guide their decisions and actions. They want to know what everyone else is doing, especially their peers. For example, the canned laughter tracks you see on TV are very effective at causing viewers to laugh longer and more often. Bartenders similarly see they get more tips when they seed the tip jar with a few dollars. Web services frequently use social proof to spur user action in their experiences. Whether it's a warm invite from a friend encouraging you to join a service that they are already using, or an article with 50 likes from your friends encouraging you to check it out, social proof is a very compelling principle to take advantage of to give your users confidence in their next action. People are easily persuaded by other people that they know and like. There are many dimensions that spur us liking others, including physical attractiveness, similarity, compliments from them, frequency of contact, and their association with other people we already like. All forms of product advertising and imagery take advantage of this by trying to show both attractive people as well as people just like you using the service to drive you to want to do so as well. People respect authority and want to follow the lead of real experts. Giving the appearance of authority increases the likelihood of compliance with requests even if the authority is illegitimate. Business titles, impressive clothing, and even fancy cars lend credibility to an individual's authority. Many business products today try to establish their brand as a thought leader and expert in their industry to build credibility and authority with their potential prospects to encourage them to try their product. The thought of losing something motivates us more than the thought of gaining something of similar value. As such, perceived scarcity will generate demand. Frenzies over the latest holiday toy is a classic example of this. Apps create scarcity in a variety of ways, whether it's limited time promotions, the scarcity of rare virtual goods in games, or messaging oriented around losing an opportunity. I hope this helps illustrate how understanding Robert Cialdini's 6 weapons of influence are helpful for product designers to build better product experiences that ultimately encourage our desired user behavior. For those interested, I encourage you to read more from Robert Cialdini in Influence: The Psychology of Persuasion.